A quick update about US/Row Shipping and sorry for not writing any sooner. We had some payment problems with the banks about the fulfillment and now we have finally resolved it, and we expect Quartermaster to start fulfillment once they receive the payment (it should be in the next day or two). So US and ROW backers expect to receive you packages soon! Additionally, I have updated the website with all rulebooks. 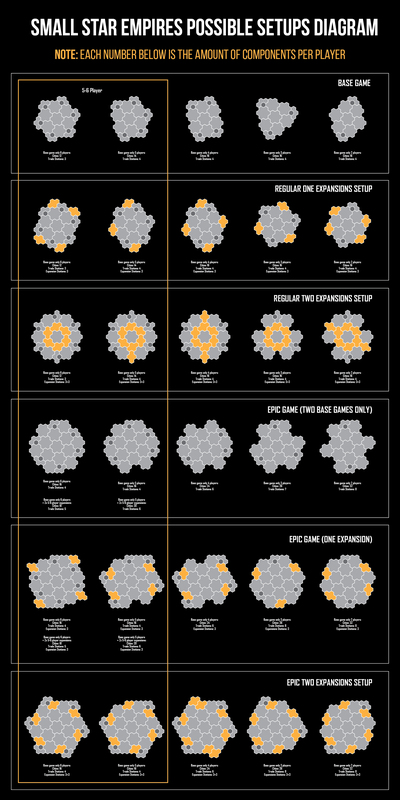 For those who need all the possible setups, I have also included the Map Setups Diagram with all the possible combinations of expansions. :) Hope this will help you! For those of you who are from EU and still haven't received the package - I simply ask of you to please wait for a bit more (I know I said that already too many times), but as you probably notice yourself, many people from EU are still receiving the packages. My guess is that this is probably due to the busy holiday season. Thanks for your patience! We will also begin shipping out the missing Fate of the Galaxy packages soon, I will let you know once that starts. Happy New Year to all and thanks for being with us! caledoneus, Vincent Verhoeven, and 18 more people like this update. With "Fate of the Galaxy" i'll receive the missing game? I haven’t received anything in Australia yet. If we're in the US we'll get it sometime next year? Or this year? And the missing and damaged items? Every update since October 2 has implied that U.S. shipment was imminent, or had already begun, yet here we are--U.S. shipment hasn't even started yet (although the shipping container did arrive on time in early Nov). So here is another post promising the delivery, so we'll wait another 2-3 weeks for the next explanation that it hasn't started yet (due to a problem that was known, but not communicated during that time). Thanks for the map setup diagrams. How many ships should each player have for the 5 and 6 player setups? Thank you Milan! Very exciting news! I haven't received anything, not even tracking information.